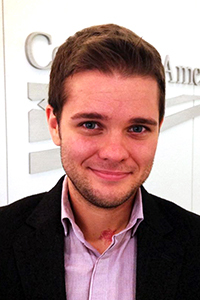 Andrew Cray—LGBT health advocate and beloved member of the American Progress family—passed away on August 28, 2014, after a battle with cancer. In his 28 years, Andrew was a champion of social justice who secured numerous policy changes that help make our communities safer and healthier for LGBT people. The White House honored Andrew posthumously as a “champion of change” for his work to connect LGBT Americans with comprehensive, affordable health insurance. Beginning in 2012, Andrew served as a Policy Analyst for American Progress’ LGBT Research and Communications Project. His research focused on LGBT inclusion and engagement in state implementation of the Affordable Care Act, health insurance policies that improve coverage for LGBT families, LGBT-inclusive data collection, and LGBT youth. In addition to his many accomplishments that garnered recognition from the White House, the U.S. Senate, and the Boston City Council, among others, Andrew helped spearhead efforts to obtain transgender-inclusive health insurance policies in several states and the District of Columbia. Additionally, he co-authored an analysis that underscored the potential for the Affordable Care Act to benefit LGBT communities, especially the one-in-three lower-income LGBT adults who were uninsured before the full implementation of the law’s coverage expansion. Andrew also played a critical role in launching Out2Enroll, a nationwide initiative that connects LGBT people and their families with new health insurance coverage options made available by the Affordable Care Act. Prior to joining American Progress, Andrew was a health law and policy fellow at the National Center for Transgender Equality, or NCTE, where he advocated for fair access to affordable, high-quality health care for transgender people. Prior to NCTE, Andrew was a legal fellow and policy analyst with the National Coalition for LGBT Health, where he served as the lead researcher and author of the coalition’s comprehensive report on veterans’ health. Andrew was also a founding member of Trans Legal Advocates of Washington, or TransLAW, which trains attorneys on transgender legal issues and operates pro bono legal clinics for transgender clients. Originally from Chippewa Falls, Wisconsin, Andrew earned a B.S. in communications from Northwestern University and a J.D. from the University of Michigan Law School. He is survived by many friends and family, including his wife, Sarah McBride, who he married shortly before his passing. Bishop Gene Robinson, another member of the American Progress family, officiated their rooftop ceremony.